On 13 November 2017, at the Lingnan University, Hong Kong, Nuria Costa talked to Professor Lau Kin Chi about her personal history. The video was edited by Lee Kiu Chi and produced by Global University for Sustainability in December 2017. On 13 November 2017, at the Lingnan University, Hong Kong, Tang Lai Fang to Professor Lau Kin Chi about her personal history. 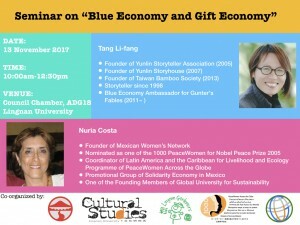 On 13 November 2017, Nuria Costa and Tang Li-fang gave a seminar on “Blue Economy and Gift Economy” in Lingnan University, Hong Kong, China, which was jointly organized by Lingnan Gardeners and Global University for Sustainability.